The saga of [once] venerable Sequoia Fund (SEQUX) and its largest holding Valeant Pharmaceuticals (VRX) has been playing out on the front pages for the past six months. It’s a great example how active management can go awry with concentrated bets. The fund started building VRX position in Q2 2010 and by the end of that year has accumulated 11.32 million shares. At that time it represented just under 12% of its portfolio and VRX was trading below $30. As VRX price continued to “go through the roof”, its share of the fund’s assets kept growing. Ironically, the money for the initial VRX purchase came from Berkshire Hathaway (BRK.A) which was around 24% of the portfolio before they parred it back to 15%. Warren Buffet has a lot of shared history with Sequoia’s founders and Charlie Munger has been a vocal critic of Valeant’s business practices. You can see history of the fund’s VRX and BRK.A positions on Dataroma’s website here and here. So what was the impact of VRX on the fund’s performance? 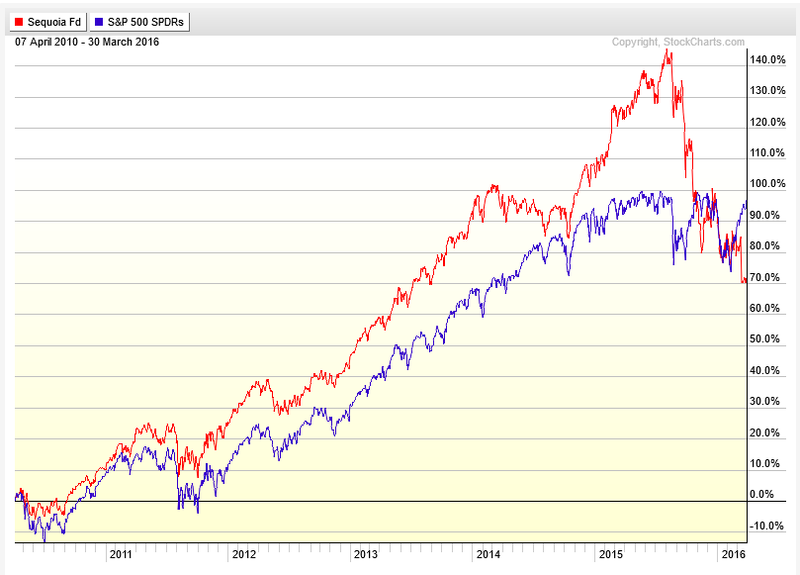 The red line in Exhibit 1 is Sequoia’s performance since April 2010 and the blue one is S&P 500. As Valeant went on a tear from $16 to $263 (no splits), SEQUX went with it. It culminated in early August 2015 with SEQUA returning +145% vs +97% for SPY. That’s where it got interesting (or painful for the shareholders)! Since then VRX dropped to $37 and the fund went from 48% outperformance to 25% underperformance versus the index! Another way to show the relationship is through correlation analysis – the degree to which two things move together. 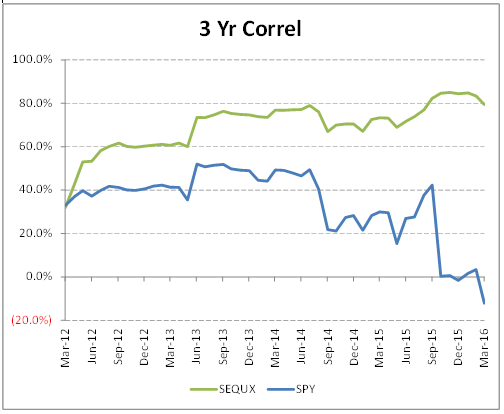 In Exhibit 2 we have a rolling 3-year correlation between VRX and SEQUX / SPY respectively. It’s clear that as the position size increased it became a bigger driver of Sequoia’s performance (the green line). In the meantime, SPY decoupled from the stock after 2013 roaring market cooled off (the blue line). 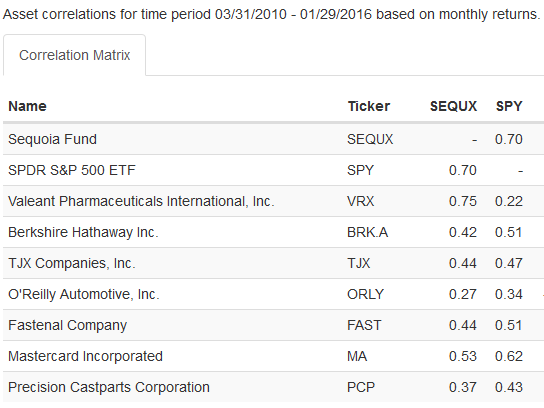 At the risk of overemphasizing correlations, in Exhibit 3 shows a correlation matrix of the largest seven holdings of SEQUX with a higher number indicating a stronger relationship between the monthly % changes of the stock and the fund or the index. Just to be clear, VRX is a Canadian company and as such is not even eligible for the S&P 500 but does approximate “the market” well. So now that we set up the analytical framework, what has been the fallout for the fund? The VRX stake reached a heady 32% of TOTAL assets in the fund by early August 2015. Despite having the 25% cap on “security of any one issuer” the fund did not reduce its stake. The investment firm that runs the Sequoia Fund, is being sued by shareholders who claim it recklessly took a huge stake in VRX causing more than $2 billion in losses. I should mention that those “losses” just evaporated its paper gains since the stock trades around where SEQUX bought it back in 2010. To add insult to injury, the fund bought an additional 1.5 million shares in October 2015 after Valeant got cut in half – paying “bargain” price of around $110 per share. It subsequently sold those additional shares in March 2016 somewhere in the high $20s. This was done to “reduce investors’ taxes by booking capital losses” – how considerate! On March 21, 2016 Bob Goldfarb was ousted as fund manager and CEO after 45 years at the firm, reportedly analyst covering VRX is gone as well. Morningstar continued to stand by the fund and didn’t drop it rating from Gold to Bronze until March 24 with VRX down close to 90% from the peak! (the fund is 30% off since early August). Investors have lost confidence and have been pulling money out of the fund, about $800 million including $230 million in the first 3 weeks of March. The good news is that ever-helpful market forces took care of the massive overweight and Morningstar analyst now estimates that the VRX stake is somewhere around 7%. Yay, no more problem! So sometimes the trees grow close to the sky, but then they make a giant mess when they eventually fall. The moral of the story: if you are going to invest in a concentrated fund, beware that it’s a double-edged sword and can lead to painful losses as well as outperformance. To mitigate this many individual investors combine several focused funds together, but then they end up with something akin to a very expensive index fund.